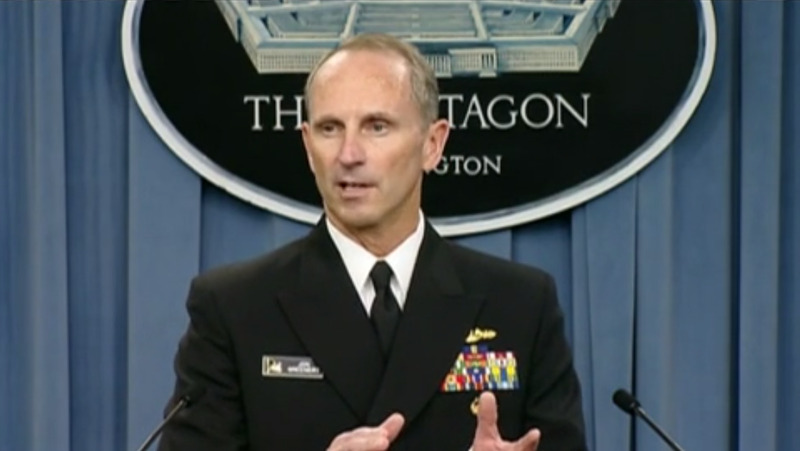 Department Of DefenceChief of Naval Operations ADM Jonathan Greenert gives a briefing at The Pentagon. The U.S. military’s ability to stay ahead of technology advances by other countries and respond to multiple crises around the world is already in jeopardy and will get worse unless mandatory budget cuts are reversed, top U.S. officials warned on Saturday. Chief of Naval Operations Admiral Jonathan Greenert told Reuters the Navy would have to cut forces and reduce its ability to position ships around the world if lawmakers did not ease or reverse the cuts, which are due to resume in fiscal 2016. “Electronic warfare, electronic attack, anti-submarine warfare – all of these higher end areas – will fall further behind because we’re just not investing in them,” he said in an interview at a conference at the Reagan Presidential Library. He said the Navy’s ability to stay ahead of potential adversaries would “degrade significantly” unless the cuts ended. Greenert and other U.S. officials are urging Congress to end the cuts known as “sequestration,” citing growing strains amid increasing threats, including Russia’s aggression in the Crimea region, and increasing Islamic State extremism in Iraq and Syria. Executives with Lockheed Martin Corp, Huntington Ingalls Industries and Raytheon Co said they were cutting overhead to drive down weapons costs but budget uncertainty limited their ability to make needed investments. Industry and military officials said the changing political landscape and escalating threats could increase the chances for another short-term agreement to stave off budget cuts. Admiral James Winnefeld, vice chairman of the Joint Chiefs of Staff, told the conference that procurement of new weapons had slowed, even as escalating demands around the world made it difficult to restore the military’s readiness for new missions. Air Force Secretary Deborah James said half of U.S. combat air forces were not at the needed level of training and maintenance to respond to high-end crises. Marine Corps Commandant General Joseph Dunford said only half of Marine Corps forces at home were currently ready to deploy. Chief Pentagon weapons buyer Frank Kendall said other countries were making rapid advances in areas such as missile technology, counter-space capabilities and fighter jets.